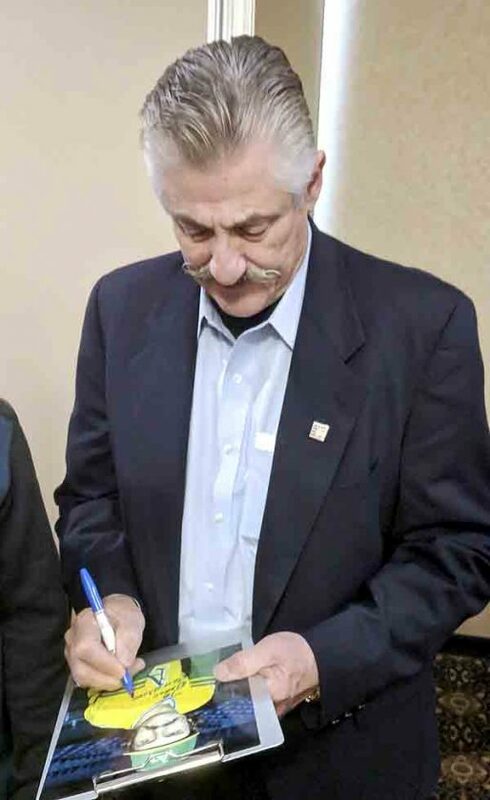 Tribune Chronicle / John Vargo Baseball Hall of Famer Rollie Fingers signs an autograph on Saturday. BOARDMAN — There he stood, just to the left of the head table, wearing a dark suit and and light blue dress shirt. No tie, just there at ease. It reminds most baseball fans of his playing career, shrugging off stressful situtations. The tall man, about 6 feet-4 inches, with salt and pepper hair, had a group surrounding him. Most were told to come back after the presentation. The 72-year-old man smiled, talked to those around him, even signed a laminated picture of himself during his Oakland A’s playing days. The pen in this man’s hands steadily inked his signature as he spoke. A latecomer was told by an event organizer to come back later. This Hall of Famer told the lady to give him the baseball, and he gladly signed. He later addressed the capacity crowd Saturday morning at the Youngstown State University First Pitch breakfast, distinguished by his famous, well-groomed handlebar mustache — former MLB relief pitcher Rollie Fingers. Fingers and current minor-league umpire John Mang were the guest speakers at the YSU event. Mang is an Austintown Fitch High School graduate and son of Mahoning Valley Athletic Conference Commissioner John Mang. As for Fingers, he told the crowd some entertaining stories. One he told before the presentation started was about fellow Hall of Famer Frank Robinson, who passed away last week. The two faced each other early in Fingers’ career when he was with Oakland. “Frank was scary,” Fingers said. “He was tough to get out. You could knock him down and it wouldn’t make any difference to him. I ran a ball up and in on him one time and he went down in the dirt. The next pitch he hit 400 feet. I didn’t know that’s the way he was. I was a young kid then. Fingers was born in Steubenville, but grew up a couple miles north in Toronto where he spent the first decade of his life. His father worked at Weirton Steel, but one day quit his job, sold the fully-furnished family house for about $1,600. They moved to California, where he honed his baseball skills. Fingers, a three-time World Series Champion with the As from 1972-74, had a career ERA of 2.90 with a record of 114-118 with 1,299 strikeouts and 341 saves completing a 13-year career (1968-85). He also played for San Diego and Milwaukee, but missed the 1983 season due to injury – the only year these Brewers went to the World Series. Stories. Fingers had plenty of them on Saturday. It’s something he loves doing, sharing his experiences with others. “If they stop remembering, then you’re worried,” Fingers said.